Yes, this was one of the strangest…..dare I say, magical….opportunities that the Secret Society of Magical Creatures had last year. I didn’t get many photos to share with you of my TEDx Mt. Hood presentation, because….well, you know….I was presenting and couldn’t take photos. Not to mention, In the dark with candles on all the tables, it was hard to get a good, clear shot of the action. Officially, my presentation was called, “an action break”, in which participants could choose an activity to do between talks. The Secret Society of Magical Creatures was 1 of 4 activities to choose from. Fortunately, there was a professional, TEDx photographer to capture some of the strangeness .…er…magic. Another very fortunate thing was that Blick Art Materials helped sponsor my presentation. It was so nice to get some support and encouragement for this strange society which seeks to help you find your magical quest. I took the participants through the first few secret documents from the “How to Discover Your Magical Creature and Magical Quest Book”. You can see the cover of the book above as it was projected on a white board. Some participants got brave and shared what they discovered with the entire group, including their magical creature. I found it very touching and many of us applauded their bravery. If you’d like to buy your own copy of this very secret and magical book…..er…maybe…strange is more accurate, I’m offering a magical discount on it for 1 week until Jan 22, 2019 . Use code MAGIC75 to get 75% off the regular price. You know what? I don't know if Sasquatch is a magical creature. What do you think? I don't know if he exists. I don't know what he's looking for or if he has already found it. What I know is that he is a part of the Pacific Wonderland, the place I call my home which is why I chose to paint him for ZB Gallery's "This Pacific Wonderland" art show. A magical creature drawing for the Secret Society of Magical Creatures. In some way, I had already gotten in touch with the spirit of the Sasquatch when I was creating drawings for the Secret Society of Magical Creatures. 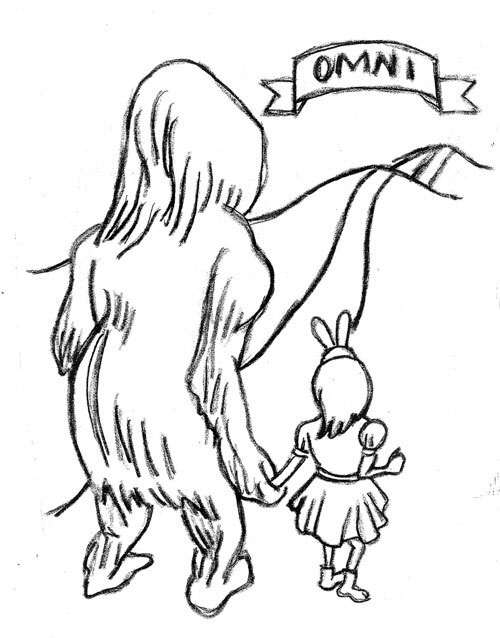 I drew an Omni (your guide on your magical quest in the Secret Society of Magical Creatures) as a big hairy creature who was going on an adventure with a little bunny girl. 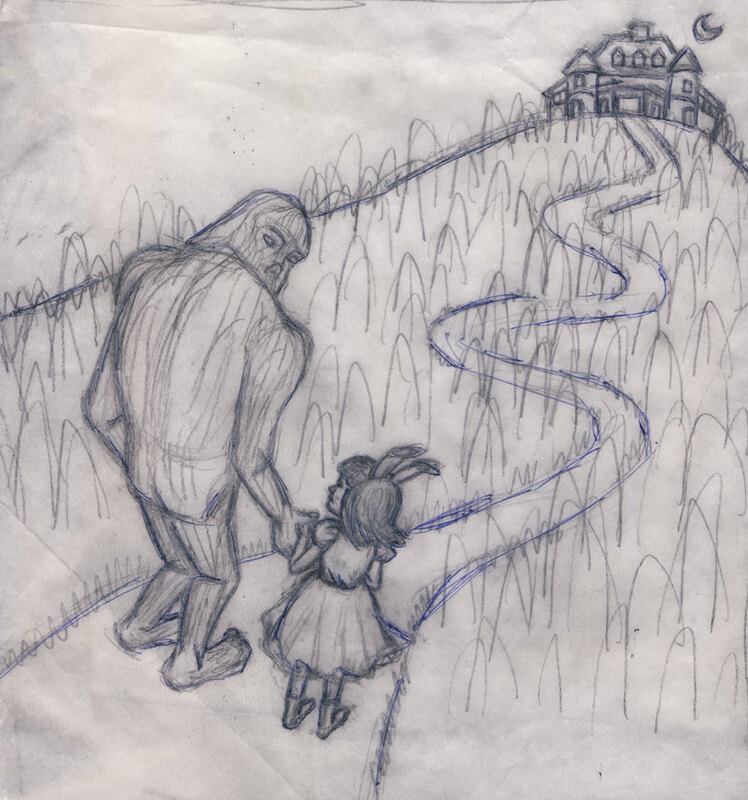 A quick sketch for the Sasquatch painting. When ZB Gallery invited me to be in their art show, I came back to that Omni drawing and decided to make it into a Sasquatch. Of course, I still wanted him to be with a bunny girl and to still be going on an adventure. The final drawing for the Sasquatch painting. I imagined the two of them having a serious conversation before they decided to proceed up the hill into the darkness towards Pittock Mansion. 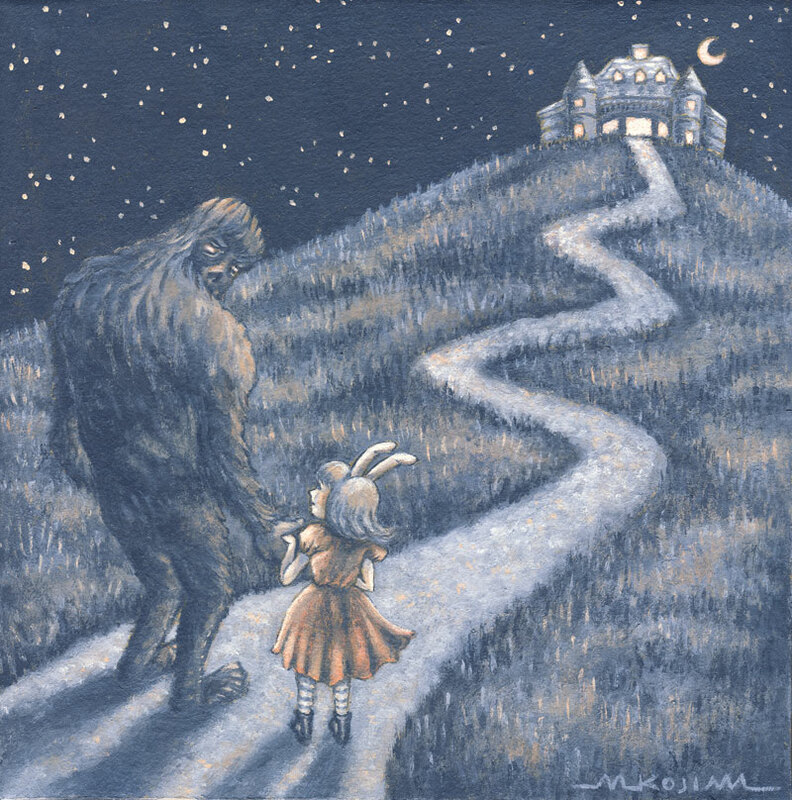 Bunny girl would tug on Sasquatch's hand and say, "Hey". And Sasquatch would look down at her and say, "What?" And they would hash it out and puzzle it over and figure out if it was a good idea to go up there or not. The final painting for ZB Gallery's art show, "This Pacific Wonderland". What do you think they are saying to each other? Whatever it is, they seem like they are going to be good friends and look out for each other. They know it's a scary, cold world out there and it's better to travel through it with good friends. You can buy this painting through ZB Gallery at this link. How many of these movies have you watched? And how many more am a I forgetting that belong on this list? If any of them make your heart race a little faster when you think of them, then you and I are of the same world. We love these fantasy adventure movies. We can't get enough of them. At some point, you'd think we'd get sick of them. But we don't. Why do we keep watching these kinds of movies, the Secret Society of Magical Creatures has some ideas. In Secret Message #24, they reveal the top 10 reason we'll always watch fantasy adventure movies. Click on the link above, to get the secrets. Have you ever wanted to be a member of a secret club with exclusive rights and privileges? I'm nodding yes. And if that club happened to be all about magic and mystery, would that make it twice as intriguing? I'm nodding yes even harder. Now, if there was such a club and if you got into it, would it mean that you were something special? Ummm.....YES.....you bet it would! I think that's what the Secret Society of Magical Creatures is all about. And guess what? They have a secret language that they teach you in secret messages as well as in their secret language book. Below are some of the drawings before and after they were colored by a secret member of the secret society who owns the book. Can you guess what these words mean? Hmm...I'm not sure. Whatever their meanings, they sure look mysterious and magical. And what better way to learn a new language than in a magical coloring book! Below is the secret link to get your secret language coloring book. Now, you'll be able to feel extra special with exclusive rights and privileges that only magical creatures have! Who else wants to enter a world where magic is the norm like in Harry Potter and where you get to live side by side mythical creatures like in Fantastical Beasts? I do. I do. That's me jumping on the next Hogwarts Express or signing up to help Newt Scamander find some magical beasts. If you want to do more than just imagine you're part of that world and instead see yourself inhabiting a magical realm, you'll die to get one of these custom portraits by The Secret Society of Magical Creatures. Who or what is The Secret Society of Magical Creatures? They hold ancient, magical secrets and they believe you are a magical creature. In fact, they have a secret formula of how to discover yours. How many magical creatures are there? Would Newt Scamander be able to categorize all of them? Well, yours won't be like anyone else's because it's customized to you. The secret formula to discovering your magical creature. 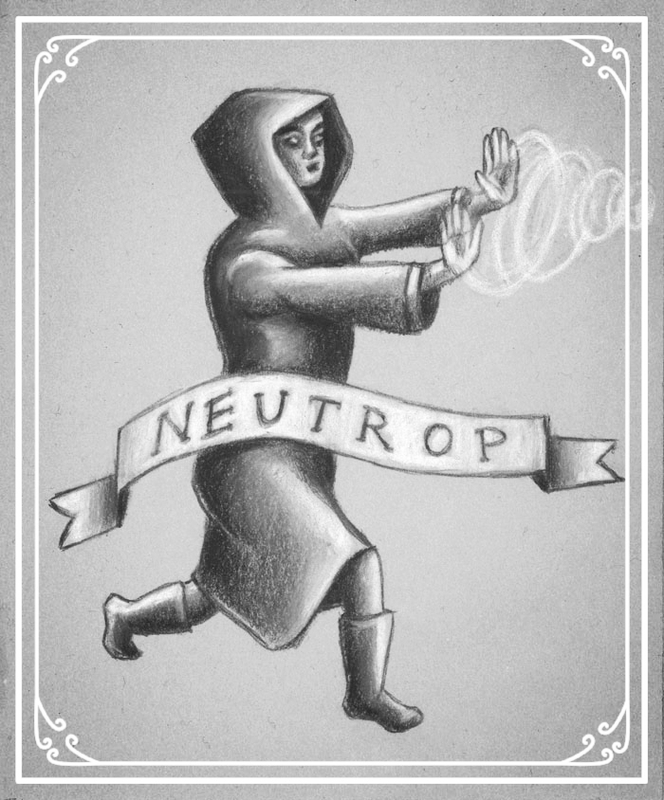 Once you fill out the secret formula, you begin the adventure of getting your magical creature drawn or painted. You choose either a small or large portrait. You'll be asked to provide photos of yourself. Finally, the magic begins with sketches of you as a magical creature. It's not just in your head, tucked away and hard to imagine. It's there in front of you, making your heart beat faster as excitement builds in your veins. It's you, but magical! Below is the custom drawing of a guy who filled out the secret formula and discovered that he is "a peregrine falcon boy who teaches and encourages others by flying around the world". He provided photos of himself and then sketches revealed what he looked like as a magical creature. Sketch of the peregrine boy custom magical creature. Small drawing of the peregrine boy. Below is the custom drawing of a gal who is "a butterfly woman who leads an empire and owns dragons by flying anywhere on a whim". She discovered this when she filled out the secret formula. After she submitted it and photos of herself to The Secret Society of Magical Creatures, the magic began. The butterfly woman was born. Sketch of the butterfly woman custom magical creature portrait. Small drawing of the butterfly woman custom magical creature portrait. Can you imagine how magical it will be to have your magical creature drawn or painted? You'll feel like you have entered that world where magic is the norm and you live side by side with mythical creatures-----because you are one of them. That's what The Secret Society of Magical Creatures believes. Do you believe it too? Get yours at this link.